I’ve noticed that when I find a really great volume of poetry, it’s one that I’m dipping in and out of for months -even years- at a time. For the past five or six months I’ve been slowly working my way through the anthology, Poetry Speaks Who I Am. I might open up the book and reread one of my favorite poems “Perhaps the World Ends Here” by Joy Harjo before going to a random page and discovering Sonia Sanchez’s “Haiku” or re-reading Emily Dickinson’s “Hope is the Thing with Feathers”. This is an anthology that has spent a lot of time on my nightstand. 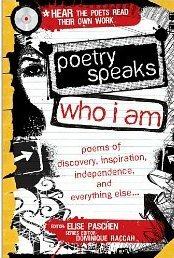 Poetry Speaks Who I Am is an anthology of poetry that compiled with teenagers in mind. It’s a book that includes poems about various subject matters from bra shopping to discovering poetry for the first time, fr0m race to experiencing the loss of someone special. Though I found a few poems that dealt with subject matters that I felt to be a bit juvenile, I kept in mind that I’m not the target audience and really enjoyed the book as a whole. Another bonus is that the book includes a CD so readers can hear the poets read their own work. There were poems written by poets such as John Keats, Molly Peacock, Edgar Allan Poe, Gwendolyn Brooks, Sherman Alexie, June Jordan and more. You don’t have to be a big poetry reader to enjoy the anthology. I think this is a great introduction to poetry for teens who don’t normally read poetry for pleasure and those who already enjoy reading poetry. Poetry is one area of literature in which I am totally deficit. Perhaps this would be a nice collection to start with. Molly, you can start with this anthology or another anthology called Good Poems which is edited by Garrison Keillor. I think anthologies for teens are great, because there are such negative stereotypes about poetry and it can be so enriching. This one sounds like it has a wonderful mix! When I was younger, I used to read and compose a lot of poetry. Now that I am older, I have found myself slipping further and further away from it. I think this book sounds like something that might relight the fire for me, and although it is targeted for a younger audience, I don’t think that would really bother me. Thanks for the great review. I am looking forward to trying this one out! I’d never really thought about reading a poetry collection over a long period of time — I usually read them straight through, but maybe that’s not the most effective strategy. I might try this with the next one. This collection sounds good! I love poetry but have been falling away from reading it. Maybe that’s because I’m reading so many other books! This collection sounds wonderful. I hope my library has it. I understand the feeling! I haven’t read many short stories, essays, or poetry this year. I hope your library has it. I’ll get book in mail to you this week. I’ve heard great things about this book and I’m starting to think that it is perfect for a non-poetry reader like me. Even though I’m not a teen, I think this is something I’d like to take a look at. I tend not to read poetry books straight through, either — which is why I have so many of them in stacks around the house, instead of on the shelves “done reading”! I really enjoyed this book, too, especially the CD with the voices of the poets reading their work. I’m not usually an avid poetry fan, but this anthology pleased me (perhaps beause I found so many of the poem relevant). p.s. I see you’re reading Wild Succulent Women in your sidebar; loved that book! This book opened my eyes to poetry (don’t think I’d read it since high school) – I loved it! The CD with author’s reading their own work was wonderful.